For the logical systems inter-connectivity, instead of using tunnel interfaces, they are using the vMX "hardware" interfaces ge-0/0/[0-7]. These are being externally bridged which is the virtual equivalent of patching loopback cables between ports on the same physical MX router. 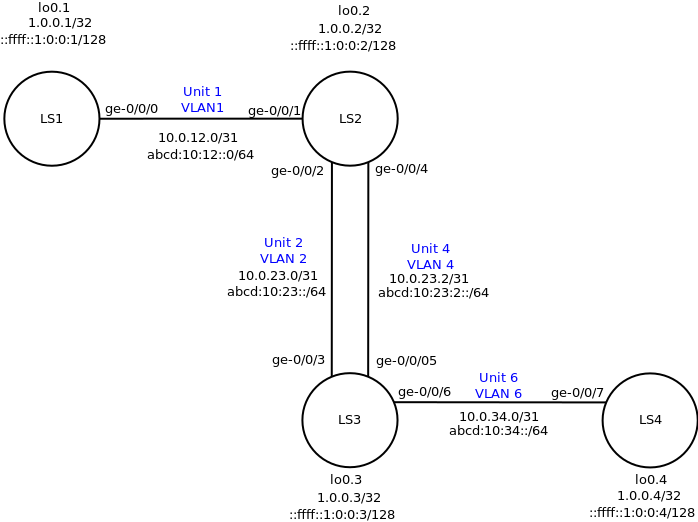 The ports ge-0/0/[0-7] on the vMX machine are being mapped into the same Linux bridge thought (not sure why this is happening, different bridges were configured for each point-to-point Ethernet link in the diagram?!) so VLANs are used to separate the broadcast domains. description          : "ge-0/0/0 interface (ls1)"
description          : "ge-0/0/0 interface (ls2)"
description          : "ge-0/0/0 interface (ls3)"
description          : "ge-0/0/0 interface (ls4)"
# Just run "sudo ./vmx.sh --start" again and it will work. set system root-authentication encrypted-password "$6$TQXJezuS$aSMhrRAC3NItnswb3bODakKaCXlA5WlY6D.HfjUctoqcTjhAmBPBTEEiiFST7wSeKomFOgbb8qX8e8.63gDWv1" # "Juniper"
set system login user ls1 authentication encrypted-password "$6$sgJwG7X2$C29KUjnppQl4sSABv8WLm95nAjC2yop5fOlfK0gkLIq0C4KHXodYDhwl1x5LTvEoIi3KTaOrawjKv.qP8mF.m1" # "Juniper"
set system login user ls2 authentication encrypted-password "$6$qIEB8mbF$m8pwl8fhBjmdvJKXrSeg/0MBTR2q4bcv8mMynmJ0UD3PAowyiftEZpMnXoId48l7shBXxoRx/4h49VZroWvgi." # "Juniper"
set system login user ls3 authentication encrypted-password "$6$kTr9zJfr$qshNQwHFeZ6W664/DiOm1KIg8BtpOKOg5lIDUyA6gnwXHCgGvWHGK9HN65sQsQdWjuZYl0Q5Co.c5TGop53dI0" # "Juniper"
set system login user ls4 authentication encrypted-password "$6$RTAGFQTe$9.IOEHJTjXI2.FxUO9gdAAuUZGWBTGiPCdC32hATkfkxEezZ85WM2Qe6GrU8urf1cMzEiIwWZoNrKdDcirgXp1" # "Juniper"
Each logical system on the vMX can be accessed using SSH. "ssh [email protected]" connects directly to the logical system "LS1", "ssh [email protected]" connects directly to logical system "LS2" and so on.